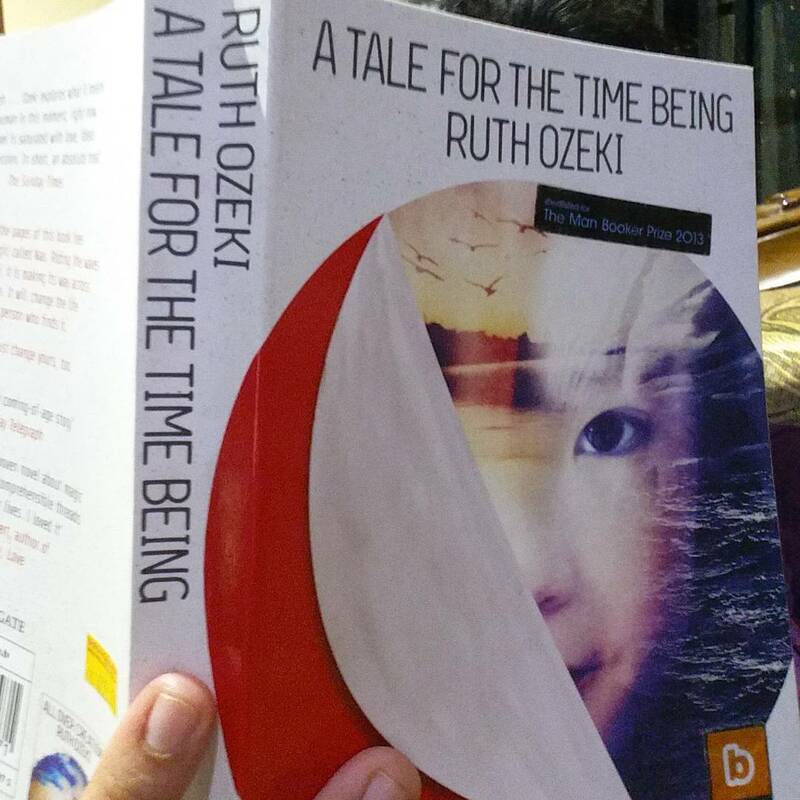 This is a review of the book A Tale for the Time Being by Ruth Ozeki. She’s a Japanese- American author, and I don’t think this is her first book.This is the first book of hers that I’m reading or that I’ve even heard of, actually and I really loved it. I gave it five stars, in fact. I’m not sure if I will read the rest of her books with a dedicated vengeance the way that I usually do though, because I have bought a lot of books that I haven’t gotten round to reading, and I keep buying new books that I hear good things about, on my Kindle and online, in addition to going on huge splurgey shopping trips at least once in a few months. It’s these books that are just sitting on my shelves and I have to read those before I even think of buying another book. I’m serious. I don’t think I’ll buy more books till New Year’s. Yikes, book buying ban! Wish me luck, eh? I bought this book on a whim because it said that it contained the journal of a girl called Nao on the back and I am a sucker for books that are in the journal format. Incidentally, this book was nothing like a regular journal. It was the journal of a teenager named Nao living in Japan, first and foremost, but it was also the story of a woman called Ruth living in a remote island in Canada. So, Ruth is a writer with extreme writer’s block who chances upon Nao’s journal under mysterious circumstances. She starts reading it and we see aspects of her life and her reactions to the journal, and her inter-personal relationships, in addition to Nao’s story. Nao’s story is told in the first person whereas Ruth’s is in the third person, which is all done very masterfully. Another thing that I really like is that Nao’s journal is in English since she used to live in America but there are bits of Kanji in it,as well as things about Japan and Japanese culture and Ruth is also Japanese-American so she understands some of it, and looks up the rest and footnotes Nao’s journal with her understanding. I really appreciated the fact that we could actually see these footnotes in Ruth’s words, throughout Nao’s journal. I don’t know why, but that was a nice touch. So, this book was a sort of coming of age story, and it also has elements of magical realism in it. I enjoyed both, even though the magical realism thing was a bit over the top, I thought. Luckily, it happened not to take away from the rest of the story for me. It dealt with sensitive topics like bullying, suicide, prostitution, etc. This is a book I’d like to recommend to anyone who had a troubled childhood, to anyone with a great imagination, to anyone with writer’s block, and honestly anyone who wants to read a unique book that’s a game-changer in my opinion. Also, I’m very proud to announce that this blog post was written on Scrivener, which I bought recently. 😀 I loooove it. Oh, do hunt me down on other social media. I’m fun and clever on those as well. This entry was posted in Book Reviews, Books, My writing (or lack thereof) and tagged award winning on August 16, 2015 by Sin.